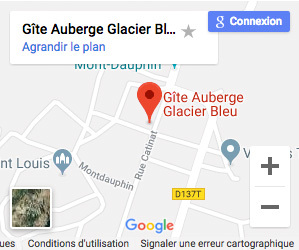 The Glacier Bleu inn is located in the Provence-Alpes-Cote d'Azur région, in the Hautes-Alpes département, between Gap and Briançon, at the heart of the Mont-Dauphin fortress. Follow the main RN 94 towards Briançon. At the roundabout 17 kms north of Embrun, you can see the fortress ahead of you. Keep going 800 metres onto Eygliers Gare, then turn right and follow the Eygliers Mont-Dauphin signs three kms. Follow RN94 towards Gap for 27 kms. When entering Eygliers-gare, turn left and follow the Eygliers Mont-Dauphin signs three kms.. The Montdauphin-Guillestre railway station is located right at the foot of the Mont-Dauphin cliff fortress, a mere five-minute drive from our inn. There are train connections from Marseille, Valence, Grenoble, and a direct sleeper train to and from Paris every day. 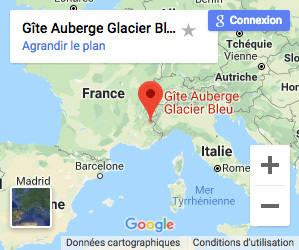 From Oulx (Italy), a stop-over for Paris-Milan TGV trains, there is a one-hour road shuttle connection to Briançon.